I haven’t even gotten through February and already ticked one of my ‘resolutions‘ off the list! Yesterday for Thursday Date Night, Handsome S & I went to the new trampoline centre (for grown-ups?) in Edinburgh, Ryze. It was BRILLIANT FUN! Trying desperately to touch the punching bag! Really much more of a work-out than I’d expected, in an hour’s worth of entertainment. One hour costs £10 for adults plus you need to buy grippy socks (£2.50) but they were out of adult socks so we just went barefoot (gross!). It was great!! 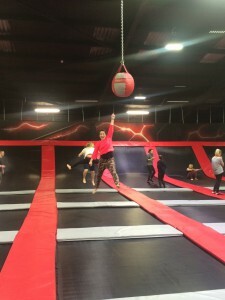 There is a dodgeball area, a basketball hoop & run up, a whole big area of trampolines of various sizes (proper moon-bouncing across the whole thing was EPIC). There was also a tight-rope and some boxes and trampolines you could use to bounce into foam-brick pits. We went around 7pm on a weeknight, but it was pretty busy. We were definitely on the upper end of the age extreme, but it was ‘themed night’, and I imagine on ‘family night’ (Mondays? ), that might be different. There’s also an area for 6 & unders in the corner (behind the dodgeball area) that was basically empty for the hour we were there. A few younger kids, but the majority were probably 15-16 year olds. To put us to extra shame, all those 15-16 year old boys and girls were doing AMAZING jimmy flips left and right! I think some were proper gymnasts (doing all sorts of mad corkscrewing, barrel-rolling jumps. As well as parkour-looking kids who were getting whistled at by the ‘flight crew’ (the staff) for climbing up walls and trying to hang from the massive suspended punching bags (which I could not even bounce myself up high enough to touch…[see photo right]). There’s also a cafe and viewing area up top. But we were too busy bouncing to check that out much. Currently audiobooking the Abhorsen Trilogy (Lirael), and Maze Runner (Scorch Trials). Aside from this, S & I are gearing up for our Lismore trip (a mini writing retreat of relaxation and fun! ), our adventure to Dublin, and I’m trying to write furiously and get organised for maximum productivity at my Cove Park retreat trip. Lots to look forward to!